What came first, the chicken or the egg? Or, as we like the ask the question around here, what came first, the chicken costume or the egg costume? It's not really that difficult of a question if you think about it...and look around our website for a while. It's the chicken costume! 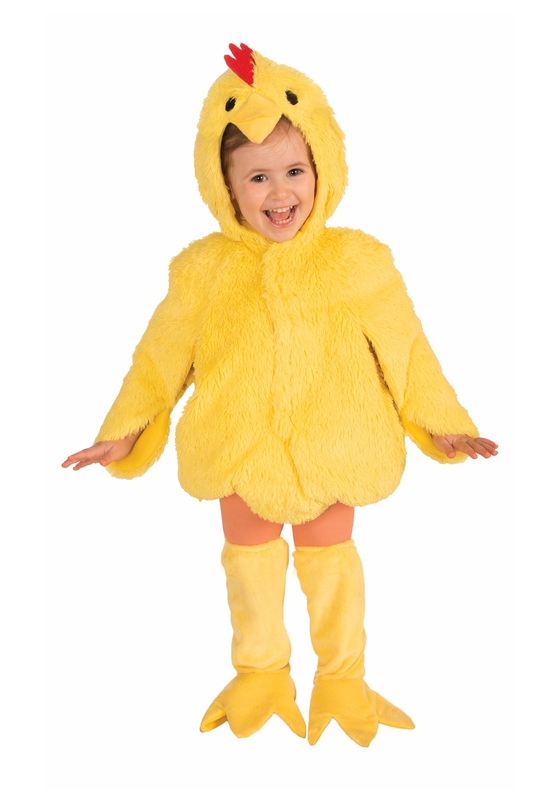 There's just something about a fluffy little chick that makes little kids so happy, and we love happy kids on Halloween or any time of year. Chances are, if you've got a little toddler at home, they love to check out different animals, talk about what kinds of noises they make, and laugh about how cute they are. Little chickies are easy to identify, and their peep peep peep is easy to imitate. Well just imagine how much fun they'll have dressing up like one of these yellow feathered friends on Halloween? They can, with this Child Plush Chicken Costume. They're sure to love it! This 100% polyester costume comes with polyurethane foam filling for a soft, comfortable fit. The jumpsuit has soft yellow faux-fur material, and the hood features felt chicken details. The front of the jumpsuit secures with a Velcro strap, and the large wings secure to arms with elastic straps. Each leg has separate openings with an elastic band, and boot tops have elastic bands at the top to secure to the leg. Check out our other farm costumes and go as a group this year for trick-or-treating!